PostNord is Northern Europe’s largest messaging and logistics operator, as well as the worldwide leader in service quality and delivery performance. At PostNord they used to unload the trailers and containers manually which resulted in back pain and tired operators. The main problem was picking heavy parcels from floor level up to the level of the telescopic conveyors which feed the automatic sorting system. Equipment: 1 Caljan belt conveyor per feed station. Equipment: 1 Caljan belt conveyor and 1 Vaculex® ParceLift per in feed station. 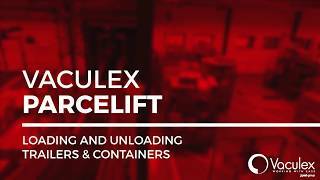 By using Vaculex® ParceLift they now avoid the heavy lifting and almost all manual lifting when unloading containers. The degree of sick absence is reduced (between 10 – 15%) down to a normal level (approx 5%). The ergonomics have improved, and the operators can keep a steady work pace throughout the whole day which increases productivity as well as user happiness. The number of strain injuries is reduced and the operators are satisfied. PostNord now fulfills the Swedish Working Environment Authorities requirements of a healthy working environment. All PostNord terminals use the Vaculex ParceLift for unloading, combined with the Vaculex TP for intra terminal handling of parcels. Gunnar Tunmats, Safety officer and operator using Vaculex ParceLift: “Vaculex® ParceLift is great to work with“. 8. Fewer operators needed. One operator, instead of two, on each in feed conveyor are now needed in this handling cycle.